2. Click the " Recent Changes" tab in the left hand column to view a list of database edits in chronological order. 6. What a new article page looks like. Login (via the little link in the top right hand corner of the screen) then click on the "edit" tab and you can change the article, add references or add links to create new article pages. Adding new content is easy in a wiki. First check that a page on the topic, even with a slightly different title, doesn't already exist. (See Naming conventions for some background on what to title a page). 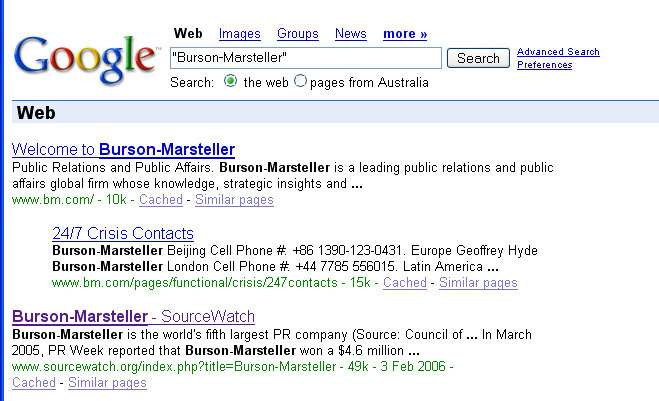 Go to the "search" bar over in the left hand column. (There are some significant limitations to the wiki search function -- an alternative way of searching all the CoalSwarm articles is via a Google search here). If the title you searched on via the SourceWatch search bar doesn't exist, the "Search results" page will come up with a message which states "There is no page titled "XXXXXX". 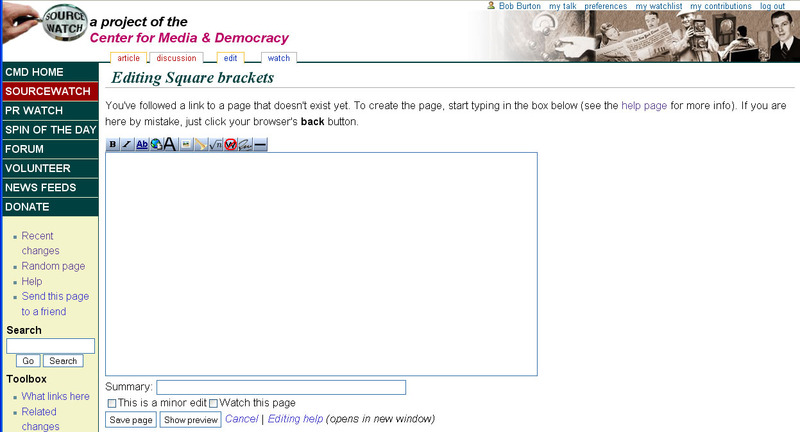 You can create this page. If you click on the red "create this page" link, the new page with the title you searched for will be opened. Alternatively, you can create a link for a new article from on an existing article page. If you go to an existing relevant article, you click the edit tab and then add the new link you want, such as in the "Related SourceWatch articles" section near the bottom of the page. To create the link for an article you want to create, enclose the page title in two square brackets. (An existing page link will display as blue, a link to a page that has not been created will display in red. If you click on a red link it will open an edit window to the new page and you can add content directly). B= bold: Bolding is best used very sparingly but, where it is needed, highlight the selected text with your cursor and click on the Bold command. The standard SourceWatch/CoalSwarm style is to start out each article with the name of the page in bold. 8. Adding the CoalSwarm badge. 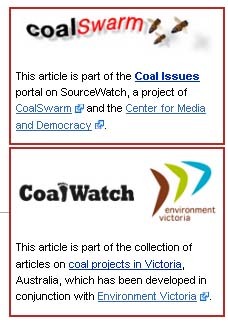 Each article within CoalSwarm includes a badge which helps identify articles within the collection, has a link directly back to the Coal portal page and links to the respective websites of CoalSwarm and the Center for Media and Democracy. Categories are used as another tool to quickly navigate to related material. Endless categories can be created as long as they are useful. For example, one category could be "coal industry lobbyists", which would cover all lobbyists around the world included in the CoalSwarm collection. Another more specific one could be "coal industry lobbyists in the United States" and another even more specific one "coal industry lobbyists in Montana" (as well as related categories for each of the other states). This category hierarchy helps readers get to the material they want quickly. When a new page is being created, the page should include at least one category link -- if you aren't familiar with relevant categories, just add one for a country that is related to the page. Other editors can add other categories later). 12: Parallel to each article is a "Talk" page (access by clicking on the "discussion" tab). This page was last edited on 9 March 2011, at 00:00.